Oman’s National Aluminium Products Company (Napco) is contemplating an expansion in production capacity which will enable it to open more distribution points for its Wicona systems product that has been enjoying strong demand, particularly in GCC markets. Sayyid Wasfi Jamshid Abdullah Al Said, chairman of the company, did not give details of the expansion but said it could happen within the next three years. Napco currently has annual production capacity of 18,000 tonnes. “Our Wicona line of products was able to contribute a sizable amount in the total amount of revenues generated in the previous year, amidst its exclusivity in distribution in Oman,” said Sayyid Wasfi. Napco has joined hands with Wicona, a leading international brand for innovative aluminium architectural systems of Hydro Building Systems GmbH, whose technology centre is based in Germany. The Omani company is the sole licensee for Wicona systems in the Gulf. The Omani company says markets prefer Wicona because its vast range of sections, accessories and fittings enables all configurations of curtain walls, doors and windows to be constructed. “This extensive range, which is fully compatible and harmonious with modern structural designs, offers unlimited possibilities for both designers and architects. Wicona systems have a proven international track record of more than four decades and have been used very successfully in executing technologically demanding and challenging projects” it added. Napco’s diverse portfolio of products comprises aluminium extrusions to serve demand from the architectural and manufacturing segments. The company offers aluminium extrusions in mill finish, anodised, powder coated, natural wood finish and thermal breaks. More than 6,000 profiles are offered to suit architectural, industrial and general-purpose applications. The company also develops customised profiles for customer-specific requirements. Customers can look forward to the anodising range in silver, bronze, black, (matt and polish finish), powder coating in all RAL shades as well as Naturall wood and marble-finish profiles. 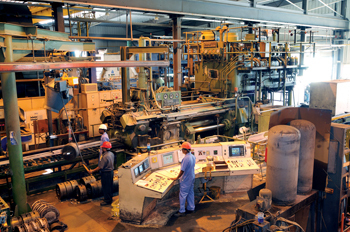 Established in 1984, the company’s plant is located in the Rusayl Industrial Estate, near Muscat city. It is certified to ISO 9001:2008 by UKAS and ANAB. A modern Chemical Testing Laboratory ensures the quality of chemical processes and a materials laboratory follows the latest standards for mechanical and physical testing. “Over the years, Napco has generated overwhelming responses from its point of exports, particularly across the GCC, Africa and European regions. We are now embarking on a strategic expansion initiative that aims to bring Napco products across more locations inside the GCC region and beyond,” said Sayyid Wasfi. Sayyid Wasfi said the company was poised to realise a 20 per cent increase in revenues for 2014 compared with the previous year on the back of strong performance in the first two quarters of this year. “The increased demand for our products along with other key factors has prompted the company’s shareholders and board of directors to bring Napco to a whole new level-tapping into newer markets and introducing more products and services. We will soon be implementing an expansion initiative that aims at increasing our market presence while at the same time allowing us wider reach across both regional and international markets,” he said. In the context of hectic construction and industrial-development activities ongoing or planned for the next three years in the Gulf, Sayyid Wasfi expressed optimism that Napco would fare creditably within that period. “The vibrancy of the region’s construction and development industry has given us the confidence of seeing continuous growth in the next few years. The GCC region is currently witness to the implementation of major construction projects and the resumption of projects that were once stalled due to the recent economic gridlock. Along with this growth comes the accompanied increase in demand for products coming from the aluminium industry,” he commented. Over the years, Napco has won several awards. One of the latest was being adjudged winner of the third place (industry category) in the Corporate Governance Excellence Award 2013 given by Capital Market Authority, Oman. The company recently announced it will implement a strategic training programme for Omanis, particularly those graduating in mechanical and electrical engineering, who wish to pursue a career in aluminium extrusion. The initiative reflects the company’s support for Omanisation. “The programme will last for six months and upon its completion, we will be offering these candidates a chance to be part of the Napco workforce. Rest assured, we will continue to show our extensive support for this government initiative and even go beyond the requirement of a 35 per cent Omani workforce in the near future,” said Sayyid Wasfi.